Disco in argento 1 oz Zombucks Walker This round design is based on the Walking Liberty Half-Dollar and American Silver Eagle Coin designs. The walking liberty is represented in its usual position, but as a zombie, with torn clothes, holding an axe and waling toward a mushroom explosion cloud, instead of the sun on the horizon. The reverse side shows a bio-hazard symbol with blood splattered around it, reminding humans of the apocalypse hazards, with the year 2017 and coin denomination of 50 Zombucks. 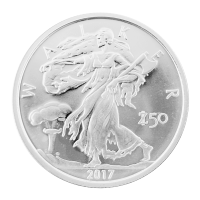 Make sure you get your Zombucks Walker Silver Rounds now, and add them to your collection of other Walking Liberty based coins. With a mintage of only 47,885 they are sure to be a collector favourite!